Home Articles Medical Injection Molding: Is it the future for your molding operation? During the past decade, many injection molding companies, large and small, have been exposed to a rapidly changing business climate. The economic effects of a changing automotive market, electronics movement to the Far East and continued cost pressure from the current industries we all serve have us looking at ways to improve our operation. One of the resultant directions from these changes is to develop new customers by finding new markets. The most common question we hear is: What do I need to do differently to get medical device customers? We would like to explore what the medical molding world looks like and how you can prepare for this industry if you choose to service these customers. Understanding ISO Standards Medical Injection Molding (MIM) is more than a plastics process. The medical molding process goes well beyond a machine, mold and material. Important factors of MIM are quality control capabilities and operational controls. Quality system compliance is one of the foremost requirements for medical molding. Many molders are using some version of the ISO quality system. The ISO standards focus on a quality system documenting how to create a level of control from incoming to shipping. Once a molder determines which level of ISO standardization they wish to achieve, annual certification will be required. Many experienced molders believe they have a top-of-the line automotive quality system already in place. We have visited many of these operations and found that they do have solid quality systems. The differences may be semantically explained, but your medical customers will expect ISO-13485 certifications  the medical device standard  when considering you as a future supplier. The ISO-13485 standard is yet another level of control and compliance for the medical device world. Achieving this level of quality control system compliance will enhance your attractiveness to potential customers. ISO-13485 references 21 CFR 820  Quality System Regulation for Medical Devices as its guidance document for regulatory requirements. Once we have achieved the appropriate level of quality system certification, we need to consider other controls in the operation. The key variables would be raw material and lot number control, process parameter controls, mold control and record keeping and environmental compliance. These variables can be very broad in scope and depth of detail. Lets take a high level perspective for this section. The certification requirements discussed previously will include sections dealing with each of these variables. The level of process control used in the automotive or electronics world may be sufficient to meet ISO standard compliance. Most injection molders should and do have some system of control for their materials, molds and processes. A system of testing and verification for your process and material control must be considered. Therefore, a review of raw material control is critical. Once raw materials and or formulations are approved with your customer, no changes are allowed without prior approval from the customer. The level of control required would include all elements of the formulation, including base material, colorants, processing aides, stabilizers, etc. The environmental controls aspect of your operation also needs serious consideration. Many molders believe they need to jump immediately into clean rooms and consequent certifications for these production spaces. Lets review the requirements and look at how you can achieve performance without breaking the bank. The intent of a clean room is to keep your production space clean. A certified clean room is designed to have a space with air control that meets a particulate count (e.g., class 100,000 clean room) and a minimum air volume turnover for the controlled space. The intent behind a clean room is to produce products in a clean and controlled space. The behaviors used in a clean room can be emulated throughout your operation without the expense of a certified clean room and yielding many of the same benefits. Clean is the key word in this discussion. Once you understand the amount of particulate that is migrating throughout your production spaces, you can begin addressing them one at a time. Examples of negative behavior or environment would be open doors and windows into production spaces, employees personal hygiene, cardboard  any cardboard, dirty machines (e.g., oil and lubricants in excess, etc), regrind, dust and pollen, packaging materials, etc. Understanding these aspects of your operational environment can help you attain success with your environmental control. Installing a clean room without modifying the aforementioned behaviors will most likely result in disaster. 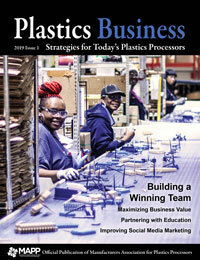 Also, use of certified clean rooms in a plastics processing environment can have its own built-in challenges. Particle count maintenance is a requirement of your certification. Failed particle count measurement usually requires significant corrective action steps before recertification or, more specifically, running production. Particle count measurement can include certain fumes and odors in the measurement, causing a negative reading. The problem here is that these fumes and odors may be present in processing plastics normally (e.g., fumes from PVC or Delrin/Celcon processing). Basically, be sure you understand the customers requirements and expectations as you develop a facility, operation and environmental plan. Now that we have discussed some fundamentals, you should have your quality system in place, your certifications should be up to date and your environmental system controls should be acceptable. With all of this current, you have met baseline requirements for the medical customer. So, what is next? How capable are your part and mold design skills? The majority of automotive customers have already designed their parts and sub-assemblies. The converse is probable with the medical design customer. Some device manufacturers have complete designs, but most do not. Design becomes yet another opportunity to contribute, or another thorn for your already burdened resource pool. A significant opportunity and focus can be helping the customer modify a design for moldability. The concept we are alluding to is full service  design to approved part. The engineers you may work with will have a variety of needs from you, not just providing toll house molding service. They will need part design expertise, prototype generation, assembly assistance (i.e., design and assembly), mold design expertise (i.e., prototype and production level), materials expertise and knowledge, to name a few. Turn-key service is nice, but very few companies can pull it off. Therefore, a company will need to develop external sources for anything they cant provide internally. We have spent considerable time discussing a host of topics vaguely related to the injection molding process. So, lets spend some time looking at technology. As good processors using the injection molding process, technology initiatives would be the same for MIM as it would for other industries. Process control, cleanliness, data retention/control and ancillary equipment integration all would be considerations when looking at the injection molding process. The machine selection and options choices should be part of your considerations once you have addressed your environmental approach, as we discussed previously.